During the months of October and November, The Cooper Union opened several major exhibitions designed and curated by alumni and faculty as part of the college's year-long 150th anniversary celebration. On October 24, The Cooper Union opened Advancing the Mission: The Cooper Union at 150, an historical exhibition commemorating the institution’s 150th anniversary. 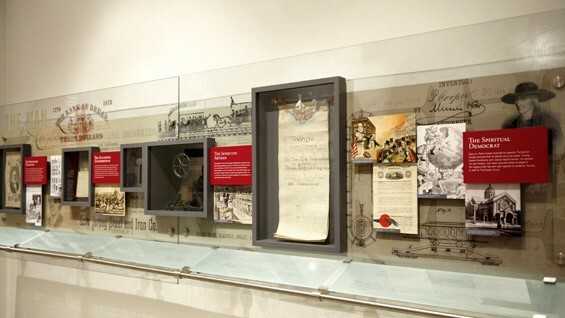 The exhibition presents the story of The Cooper Union, its origins in the values adamantly held by Peter Cooper, and its historic promotion of the democratic ideals of free education, social justice, philanthropy and civic virtue. The Great Hall’s centrality in advancing these ideals is emphasized in the exhibition, as are the evolutions the institution has undergone in continuing its leadership in public service. Designed pro bono by Lee H. Skolnick (AR’79) and his company, Lee H. Skolnick Architecture + Design Partnership, the exhibition is located just outside the Great Hall where it provides visitors to Cooper Union with a broad view of the institution and its place in New York City history. The exhibition was fabricated by the Foundations Group, headed by Saif Sumaida (AR’92), overseen by Harry Gaveras (AR’93) who acted as owner’s representative, and received support for graphics through Trustee Mark Epstein (A’76).